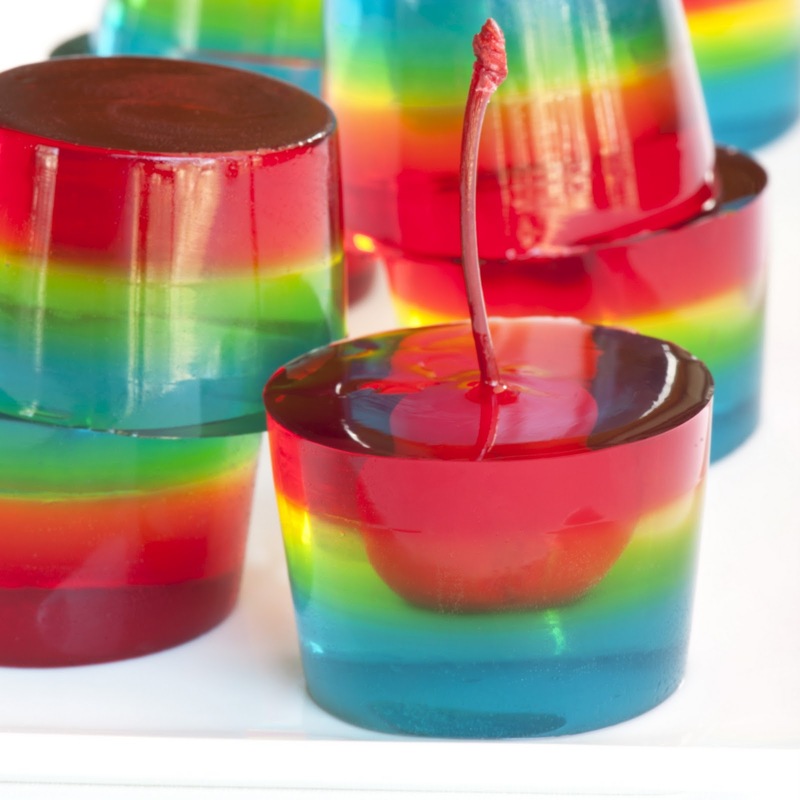 Rainbow Jelly Shooter ... oh yes! So, when the weekend rolled around, rather than trolling cocktail books for jelly shot inspiration, we decided it was high time for a bit of unfettered f-u-n . . . FUN. That's what jelly shots are all about, anyway, isn't it? Back to our roots so to speak . . . as such, we are happy to present our nod to sunny days, good times and the old school Jell-o shot, Rainbow Jelly Shooter. I love the "rainbow" gelatin technique - borrowed from the popular recipe for kids' finger gelatin. Only three colors of gelatin are used: red, yellow and blue - the light bends the layers into a rainbow. Also, while any three colors of gelatin could be used, but be mindful about the color wheel when determining layer placement, as green next to red or purple will result in a less than vibrant shade of brown. A cylinder shaped silicon mold from Kerekes was used to set the jelly shots, see here for details. If flexible silicon molds are used, prepare the molds with a quick spray or wipe of vegetable oil, then wipe the molds clean with a clean paper towel. This will leave a slight residue to assist in unmolding, but will not affect the taste or appearance of your jelly shots. Pour water in small saucepan, sprinkle with Knox gelatin. Allow to soak for a minute or two. Heat over low heat, stirring constantly, until gelatin is dissolved, approximately 5 minutes. Remove from heat. Add the gelatin dessert mix, stir until dissolved. Stir in the vodka. Pour into pan and refrigerate until fully set, about an hour. Pour water in small saucepan, sprinkle with Knox gelatin. Allow to soak for a minute or two. Heat over low heat, stirring constantly, until gelatin is dissolved, approximately 5 minutes. Remove from heat. Add the gelatin dessert mix, stir until dissolved. Stir in the vodka. Allow mixture to cool to room temperature, then pour over the set red layer and refrigerate until fully set, about an hour. To serve, cut into desired shapes or unmold.